Much of what the “Black Lives Matter” movement is doing makes us uncomfortable, particularly those of us who are white. This is as it should be. If we’re comfortable where we are “at”, we won’t move, we won’t improve, we won’t change. If the injustices that exist are to be righted, we must be made uncomfortable. We must be made to see those things which are invisible to us because they’ve “always been that way” – working well for us, and so we ignore them or are unaware that they operate in our favor: that’s the very definition of “structural racism.” Yet, these same structural prejudices that are so deeply intertwined within our society and legal system do not work so favorably for others. 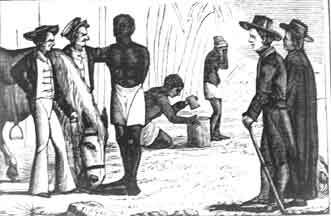 The first slaves arrive in Massachusetts on board the Desire, December 12, 1638. We often forget that slavery was everywhere in the US until the early 1800’s, and it was no prettier in Massachusetts, New York, or New Hampshire than it was in Texas, Delaware, or Virginia. Some of the best known Blacks in U.S. History – such as Sojourner Truth, William Still, and Lucy Terry Prince – were born into slavery in the North, or were transported here as slaves from Africa. Many of our most famous native sons here in New England (such as John Winthrop, founder of the Massachusetts Bay Colony) sanctioned slavery. Many of the wealthiest families of New England and New York in the 17th, 18th and 19th centuries built their fortunes upon the slave trade. And, we forget that slavery was very much present in places like Massachusetts for over 150 years. In fact, with the sole exception of Vermont, slavery was not abolished in any Northern State until after the American Revolution, and was not fully abolished from all Northern States until 1865. Another aspect of oppressive systems, such as slavery – and like any institution or behavior deeply embedded in any society or organization – is that its effects persist long after people even remember that it was there. You see this in how some churches keep on “chewing up” new Ministers, in how corruption keeps on toppling one political figure after another in certain communities, or in why we here in America drive on the right hand side of the road, or why we set the table with the fork on the left. Prior to the Revolution slavery was found everywhere in this nation; and its cousin, racism, still is. Their effects are still with all of us – twisting how we view the world and our neighbors, and limiting or destroying the greatness and beauty that is within each of us. Being unconscious or dismissive of this fact means that slavery’s pain and oppression will continue to work it’s evil within us and our descendants for generations to come. So, when seeing the #BlackLivesMatter protests in Chicago, Detroit, Seattle, here in Boston, and in so many other places: there are many reasons why the black protests of the last few years have been largely in the big cities of the North. One of which is that Slavery was here for generations – in every State, not just the South, and its legacy is still very much alive – both here in the U.S. and elsewhere. Many believe that electing a Black President showed that America had solved its “racism issue.” The #BlackLivesMatter movement, and the events that sparked it, demonstrates the opposite is true. Certainly, we have come a long way in the last century: even the concept of miscegenation is foreign to most born in this country since 1960. Our armed forces were integrated in 1948, and the era of Jim Crow is long dead. But, the rush to make changes to electoral laws and procedures in many states in the South (following the Supreme Court’s ending of Federal oversight over elections there, in 2013), and the nature of those changes, leaves many justly concerned. And, the clear and overwhelming prejudice of our law enforcement and justice systems against blacks and minorities shows that we still have a long way to go. Certainly, much of what the Black Lives Matter movement is doing makes us uncomfortable, particularly those of us who are white. This is as it should be. If we’re comfortable where we are “at”, we won’t move, we won’t improve, we won’t change. If the injustices that exist are to be righted, we must be made uncomfortable. We must be made to see those things which are invisible to us because they’ve “always been that way” – working well for us, and so we ignore them or are unaware that they operate in our favor: that’s the very definition of “structural racism.” Yet, these same structural prejudices that are so deeply intertwined within our society and legal system do not work so favorably for others. We won’t like the changes – at first, and we definitely don’t like being told that we are either racist or smug progressives by those within the #BlackLivesMatter movement, but that’s OK. If we really believe that all are created equal in the sight of God and man, and deserve to be treated with respect and compassion, then we will eventually come to welcome the changes that are now upon us, because they will erase the secret stains and hidden favoritism that troubles our souls. Next Next post: What is a “Respectful Dialog”?